We may all have a different favorite winter pastime activity, but we can probably agree that we would rather be doing other things (e.g. reading a book, spending time with family, or relaxing by the fireplace) than removing snow pile after snow pile from our decks and driveways during the winter months. YARDMAX YB5765 Two-Stage Snow Blower, 6.5 hp, 196cc, 22"
If you live in an area which expects 6 or more inches of snowfall each year, investing in a gas snow blower might be one of the most cost and time effective decisions you can make. Most gas-powered snow throwers rely on a combination of an electric starter and gasoline power to effectively deal with heavy snowfall over rough terrain and large areas. 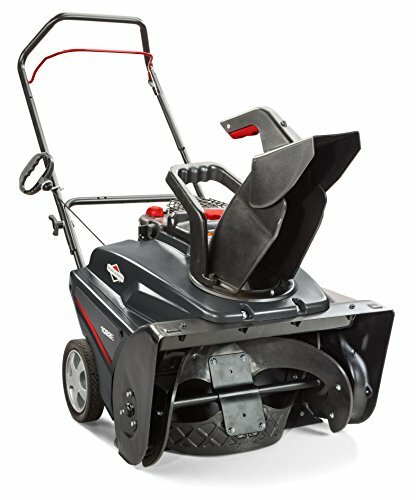 While gas snow blowers demand more maintenance than their electric counterparts, they are tougher and provide more power. 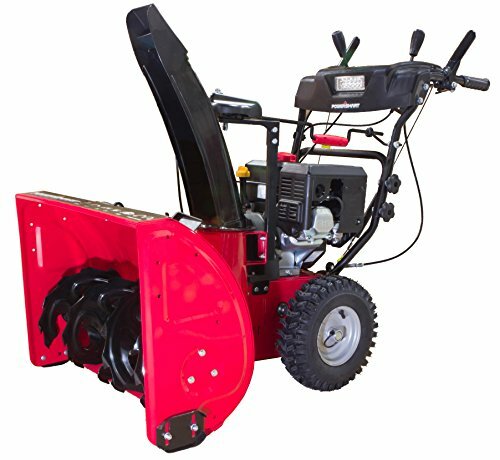 Gas snow blowers can be divided into single-stage blowers (which only feature one auger, the corkscrew-shaped paddle that pushes snow into the blower) and dual stage blowers (which feature an auger and an impeller that breaks down large chunks of ice and snow, so that the blower can push snow of out the chute more smoothly). While single-stage blowers are perfectly capable of handling less than 4 inches of snowfall; you will probably need a dual stage blower for more demanding tasks. To help you choose the best gas snow blower for your snow removal needs, we have compiled information on the best six gas snow blowers currently available on the market. 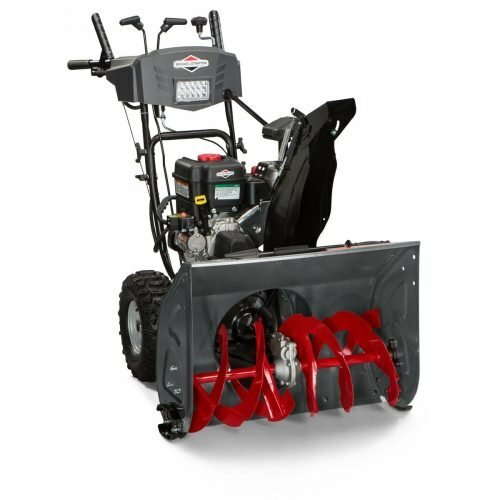 The Briggs & Stratton 1696619 Medium-Duty Dual-Stage Snow Thrower, with a 250cc snow series engine, was designed to clear a 27-inch wide clearing path and a 20-inch depth with ease and efficiency. With a push of the electric start button, you can begin making quick work of heavy snowfalls with the aid of the friction disc transmission. The freehand control allows you to drive the snow thrower with one hand while using the controls with your other hand, eliminating some of the usual hassles of operating a snow thrower. Meanwhile, the dash-mounted chute rotation and the on panel chute deflector makes the job even easier. Other features include the single LED headlights (which allow you to work at night) and the steel reversible skid shoes (which require less effort to manoeuver it through various types of snow conditions). It comes with a 3-year limited warranty and a durable steel frame. 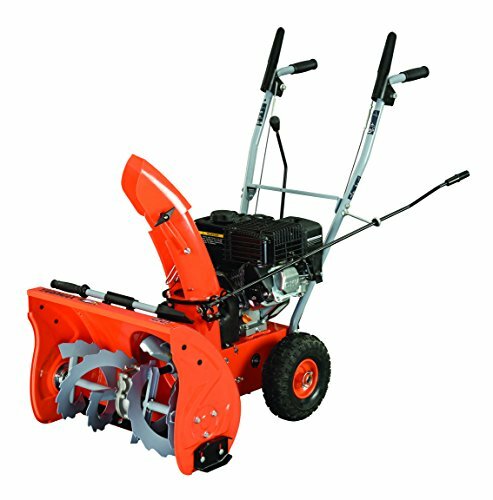 The Husqvarna ST224 is a two-stage snow thrower that comes in a dark orange design. It is well equipped for dealing with up to 12 inches of snow and has a 24-inch clearing path. It features a 208cc Husqvarna engine, an electric start, a LED headlight that allows you to work at night, 180-degree remote chute rotation with a remote deflector, heated grip handles, 12-inch improved performance ribbon augers, friction disc transmission, an aluminum gearbox, 15-inch tires, and a 2.7-liter fuel tank. The Poulan Pro single stage snow thrower promises to make quick work out of any snow clearing job with its powerful 136cc Poulan engine, which provides 7.11 foot-pounds of torque. It relies on durable rubber augers to propel itself forward, gathering snow and throwing it through the cute. 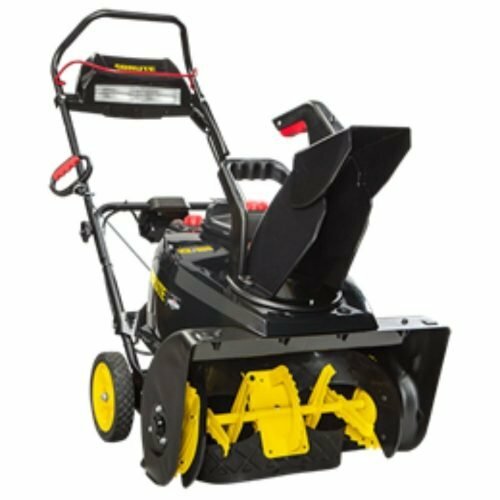 It is best suited for clearing moderate snowfall (up to 6 inches) from smaller areas, paved areas, 2-4 car driveways, and sidewalks. The controls are large and easy to operate while wearing gloves, while the ergonomic handle and rubber over-mold bail arm ensure your comfort. The quick release folding functionality also ensures your convenience when storing and transporting the unit. 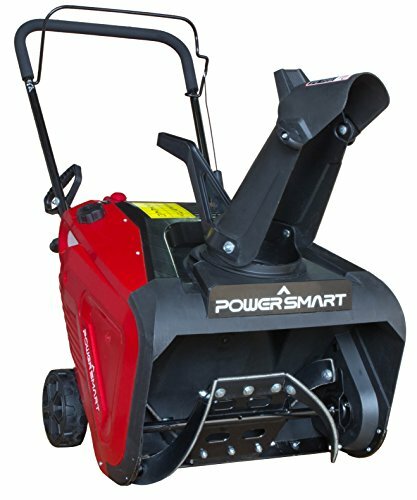 The Power Smart DB7103-26 is a two-stage snow thrower with considerable power, thanks to its 212 cc Power Smart Snow Engine. It was designed for heavy duty snow-clearing action in especially cold conditions and features a versatile drive system which allows for 6-forward and 2-backward speed variations for enhanced driving convenience. It is well equipped to deal with now up to 21 inches in height and can throw snow up to 30 feet away in your preferred direction (via the 180-degree chute rotation). It has an electric start and a recoil start, and a remote chute control on its control panel. Other features include an LED headlight and a two-year warranty. 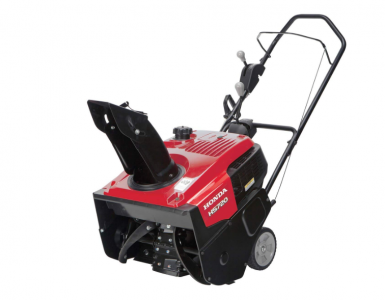 The Briggs & Stratton 1696563 is a medium-sized steerable dual-stage snow thrower, with a 306cc snow series engine, that can cope with a 29-inch wide clearing path with a 19.5-inch intake height – thanks to its powerful Briggs & Stratton 1450 Snow Series Engine that can function at -20? F and features 14.5 foot-pounds of gross torque. It can remove snow from sidewalks, pavements and other outdoor surfaces with remarkable efficiency. It uses electric start for effortless starting, while its steel frame, chute, notched auger, dual trigger steerable transmission, polymer reversible skid shoes and 16-inch by 6.5-inch Arctic Trac tires help you plow through heavy snowfall in harsh winter conditions. Other features include a dash-mounted chute control, an on panel deflector control, heated hand grips, freehand control (which allows you to drive the snow thrower with one hand while using the controls with your other hand), and electric chute rotation. It also features trigger steerable transmission (which allows you to shift without de-clutching), gear-on-gear drive for no slipping, and an ergonomic 2-trigger design. Since its transmission is lubricated for life, you practically have no need to worry about maintenance. The gearbox is also made of durable aluminum, which also ensures durability and longevity. 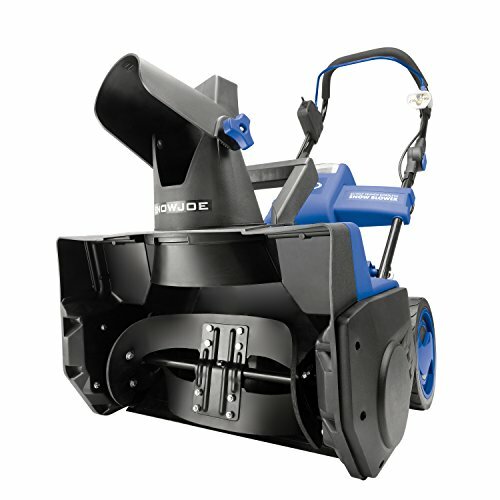 With its 205cc Brute engine, the Brute 169666 single-stage snow blowers are well equipped to deal with light to medium snowfall and features the innovative patented SnowShredder™ serrated auger. 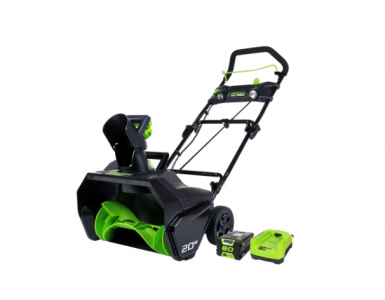 Its fourteen high-performance serrated surfaces will make quick work of all the snow on your driveway or sidewalk with its advanced ice chopping and snow removal power. You can easily rotate the chute from left to right (up to 200 degrees) and adjust the distance snow is thrown from the snowblower handle. When choosing which gas snow blower to purchase, there are several things to consider; the annual snowfall in your area, the terrain you will be dealing with, and the size of your yard or lawn. If you plan to clear snow when there is little or no sunlight, be sure to purchase a gas blower with an LED headlight. Do also note that gas snow blowers typically require more maintenance work than electric models. Be sure to add stabilizer to the gasoline to stretch fuel use and avoid engine corrosion, empty the tank before storing it away after the snowfall ceases, and inspect the spark plugs and tires carefully each year before the snow starts piling up. With the right gas snow blower and proper maintenance, you can look forward to owning a worthwhile investment that will allow you to spend most of your winter doing the things you cherish most.